FAST food is not just bad for our waistlines, it could also be contributing to the severity of asthma and eczema. 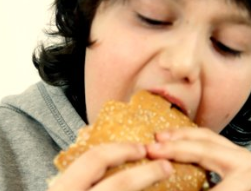 An international study involving half a million children and adolescents found three or more servings of fast food a week was linked to an 40% increased risk of severe asthma, eczema and rhinitis, a condition characterised by a runny nose and watery eyes. Butter, margarine and pasta were also linked with severe asthma in adolescents. The study has the potential to overturn the so-called ”hygiene hypothesis” – that our obsession with cleanliness is behind the rise in allergic conditions around the world. The study was part of the International Study of Asthma and Allergies in Childhood, a large research project encompassing more than 100 countries and nearly two million children worldwide. The report’s authors, including Professor Colin Robertson from the Murdoch Children’s Research Institute in Melbourne, said there were plausible reasons for fast food increasing the severity of the conditions. Fast foods often contain high levels of saturated and fatty acids which are known to affect immunity. The authors said the findings did not suggest fast food caused the diseases, but if further research did prove this it would have major public health implications given the high consumption of junk food.